Like all of the big horror icons, Jason Voorhees has gone through several changes throughout his decades-spanning reign of cinematic terror. When he first came onto the scene he wore a bag over his head, replaced in the following sequel with a soon-to-be-iconic hockey mask, and he even changed from a human monster to an undead one, as the franchise got longer in the tooth. But it was in 1989 that Jason underwent his biggest change, and in fact the most oddball transformation of all the cinematic slasher icons – which is saying something, considering Freddy Krueger became a killer television set at one point. I’m of course talking about LJN’s Friday the 13th video game for the Nintendo Entertainment System, which took some pretty big time liberties with the franchise and its main character. 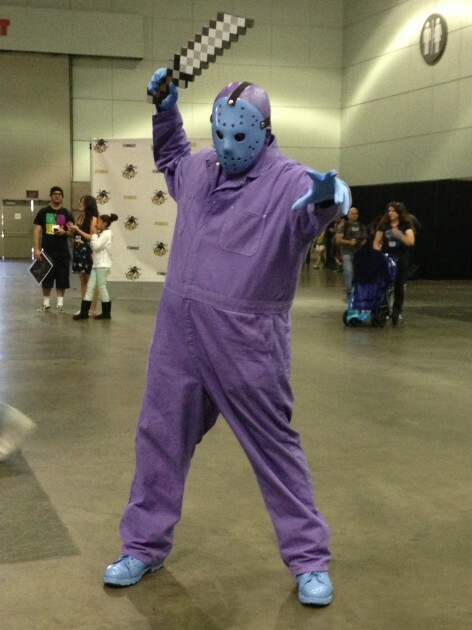 For reasons unknown to myself, the Jason Voorhees depicted in the much-maligned game had baby blue skin and wore a bright purple outfit, with a mask that matched the color of his glowing flesh. I can be pretty sure that the big guy wasn’t happy with the colorful makeover, and fans were needless to say none too pleased about the change either. But something incredible happened last year. Something that nobody could have predicted. After 24 years of the Friday the 13th NES game being a low point in the franchise’s history, it suddenly became a high point. No longer forgotten and hated, the game – and particularly its strange depiction of Jason Voorhees – became both beloved and embraced, seemingly overnight. Though the credit is given to toy company NECA for turning 8-bit Jason from oddity to icon – which they most certainly did – an equal amount of credit must be given to fan Will Edwards, who was actually the first one to come up with the idea of repainting an existing Jason toy into one that resembled his 80s video game appearance. It was at the 2013 San Diego Comic-Con that NECA unveiled their exclusive 8-bit Jason action figure (with glow-in-the-dark mask, hands and feet), which became so wildly successful that it kick-started an entire line of video game-based toys from the company – Freddy, RoboCop and Predator followed in Jason’s wake. 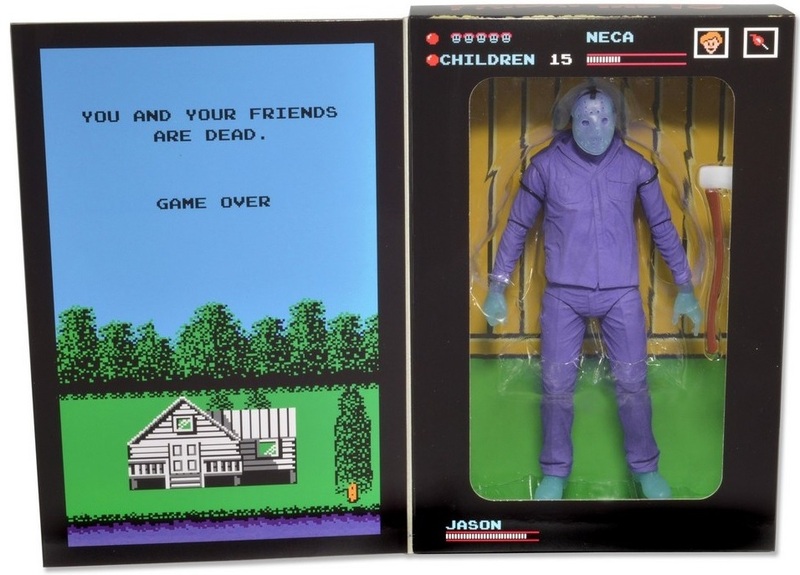 Housed inside of a collectible box that replicated the packaging of the Friday the 13th game, NES Jason was the must-own horror toy of 2013, almost instantly fetching upward of $100 on eBay. Since only a limited run of the toys were produced, their value has gone nowhere but up in the past year, and many fans are still dying to get their hands on a representation of Jason that they once shunned. Worth noting that NECA gave written credit to Will Edwards on the packaging for the figure, which just goes to show how much of a stand-up company they are. As part of this year’s first series of their ‘Horror Classics Mystery Minis’ vinyl line, Funko tossed NES variants of Jason into select blind boxes, making 8-bit Jason more adorable than ever before. The chase figure was found in one out of every 72 boxes, and oftentimes sells on eBay for $30-40. Taking a page out of NECA’s playbook proved a smart decision, as many blind boxes have been purchased by fans, in the hopes of pulling the rare variant. Speaking of Funko, it looks like they’re not done with NES Jason just yet, as they tweeted this photo out earlier this week. 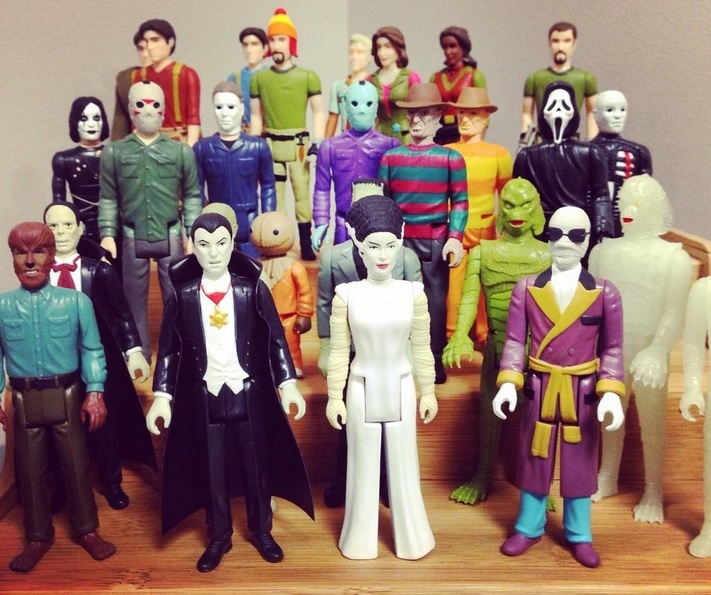 Pictured are the company’s retro-style ReAction Figures, with a surprise appearance from 8-bit Jason (as well as Freddy!). 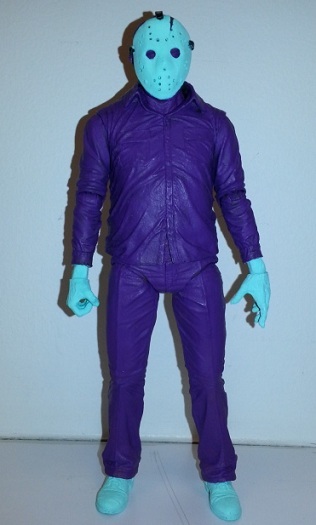 The repaint of their regular Jason figure hadn’t been teased or announced prior to this image being released, and it’s set to be a Toy Tokyo exclusive, sometime this year. 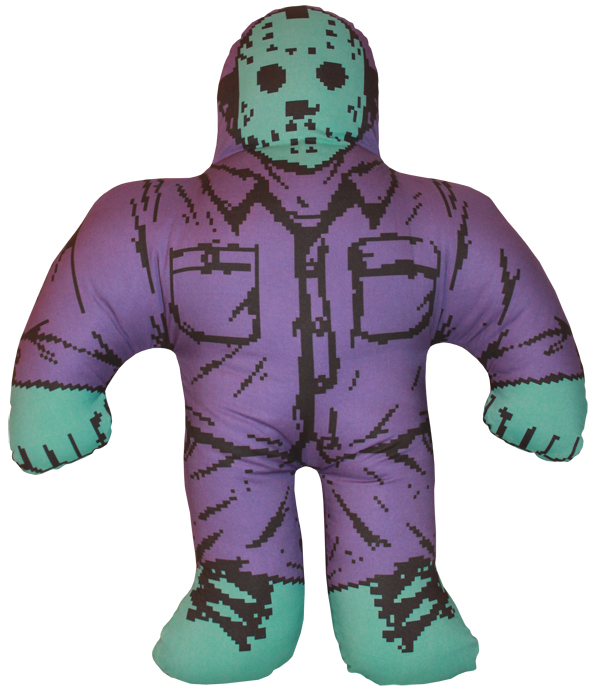 Even I got in on the fun earlier this year when I partnered up with Horror Decor on a Jason Voorhees version of the 90s WWF Wrestling Buddies, offering up a limited edition NES variant for one week only. Not surprisingly, it sold like hotcakes, and I still get e-mails all the time asking if it’ll ever be back. Unfortunately, it was a limited edition offering that’s gone for good, but the regular version of Jason is still available, along with several different Freddy buddies. So be sure to poke around the Horror Decor shop! 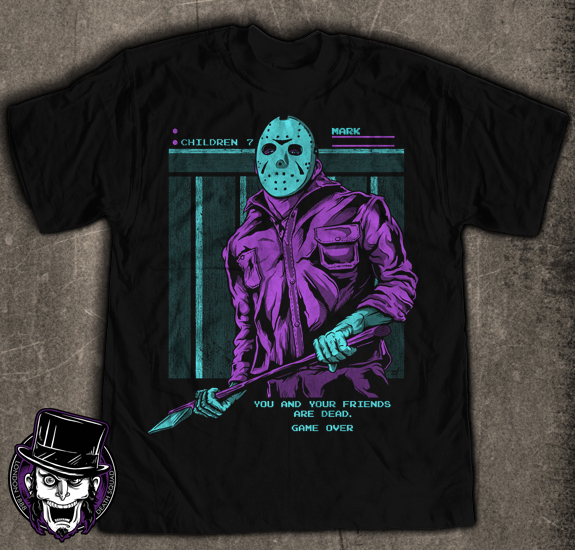 Artist Christopher Ott took advantage of NES Jason Mania with this awesome shirt, sold through his company London 1888. The art is available on both a t-shirt and as an art print, and Ott recently released a similar design based on the NES Nightmare on Elm Street game. 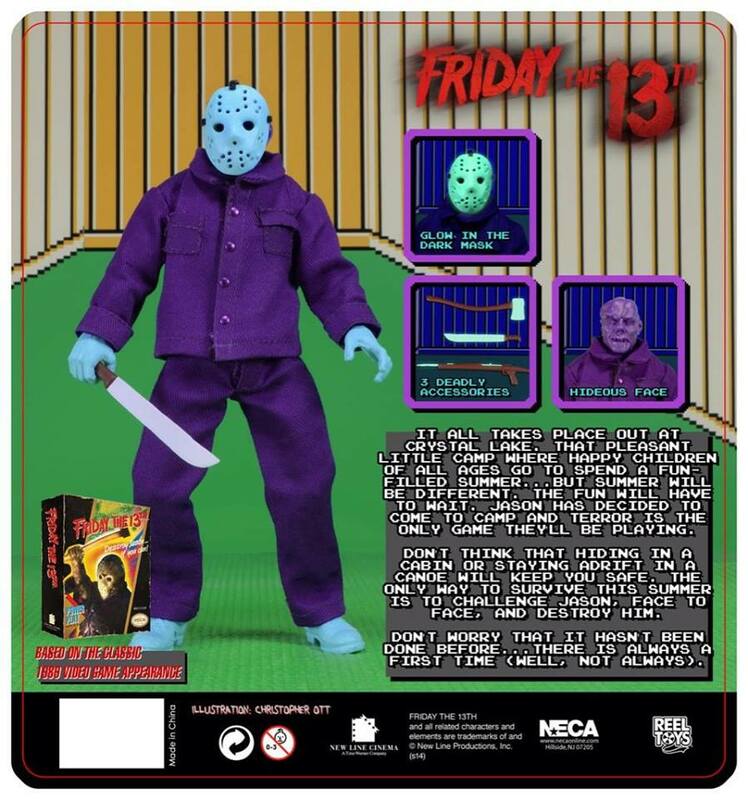 Proving that there’s still a whole lot of steam left in this phenomenon’s tank, NECA just released this MEGO-inspired NES Jason figure into Toys R Us stores, fusing together their retro and video game lines. The surprise figure is a Toys R Us exclusive, so be sure to check your local store this week. The item number is 477225, so ask for that number when you call up or pay your TRU a visit. 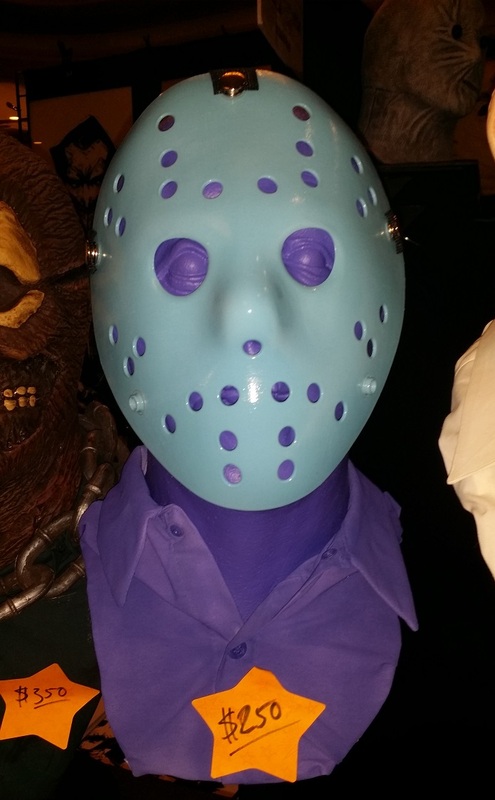 NES Jason even made an appearance at Monster Mania this past weekend, with this awesome bust being sold at the Kreation-X booth. It’s not listed for sale on their website, but if you drop the company an e-mail, I’m sure they’ll be able to hook you up with one. Really wish I could afford one, because it’s one of the coolest things I saw in the dealer room. 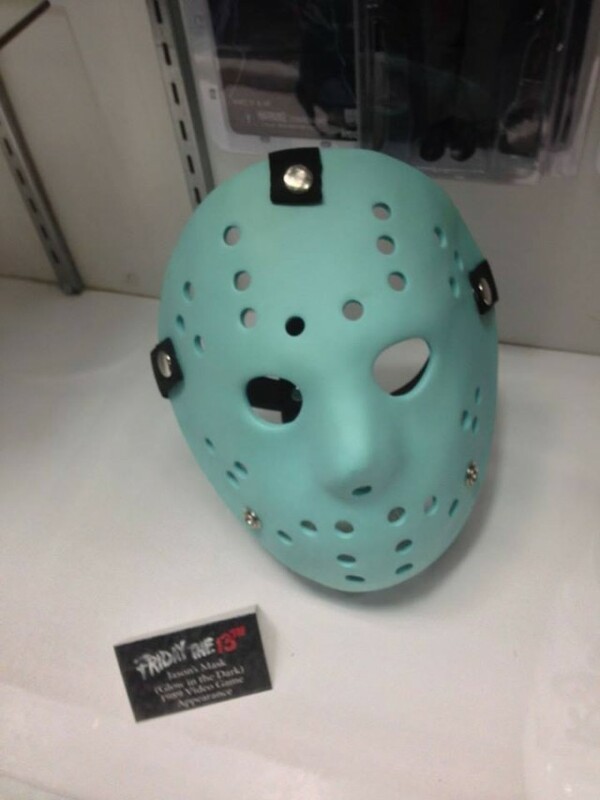 On a related note, NECA teased a life-size NES Jason mask of their own at this year’s San Diego Comic-Con, which will glow-in-the-dark, just like the one worn by their Comic-Con action figure. No release date or pricing details have been announced, but you can expect that information real soon. It’s likely that they’re going to strike while the iron’s still blazing hot, so I’d expect this mask to see release in time for Halloween. 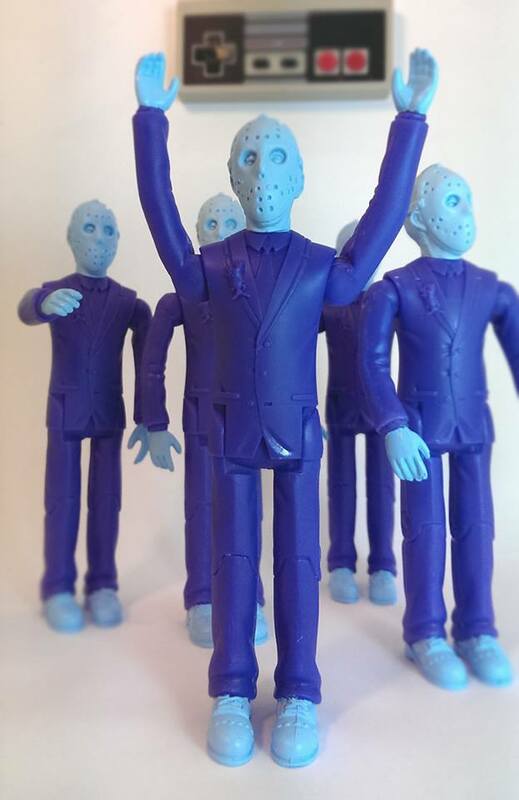 And finally, bootleg toy company Jack’s Attic has been offering up all sorts of fun Jason figures this year, and they’re delving into NES territory with this weekend’s brand new custom. An 8-bit repaint of their ‘Jason at the Prom’ figure, this variant is limited to only five and is selling for $20, exclusively in their online shop. They go up for grabs this Friday (8/22) at 12:30pm EST, so be sure to grab one quick, before they head back into the land of 8-bits. The resurgence of interest in Jason’s most oddball of outings serves as proof of the fact that sometimes all it takes is one fan with an idea, to turn some throwaway aspect of the past into something truly awesome in the present. I think I speak for all horror fans when I offer up a big thank you to Will Edwards for being that fan in this particular situation, and to NECA for realizing that Will was onto something. Has this blue & purple cash cow been milked for all it’s worth, in the past year? Sure, I can’t deny that. But I’ve been loving every second of it, and I never tire of seeing fans putting their own spin on the color scheme. As Dinosaur Dracula recently pointed out, “What began as an odd color choice in an old Nintendo game has become one of the slasher’s most iconic looks,” and that’s a pretty awesome thing. I leave you with the latest music video from Friday the 13th-inspired punk band The Jasons, which puts the members of the band into the game. It’s one of the coolest exports of the phenomenon, and it seems quite fitting that we have the video play us out!